Terms & Conditions apply to all Tennis4Kids programmes run for students, applied for and consented to by the parent or guardian. Changes to these terms and conditions require the written consent of Tennis4Kids. Terms & Conditions shall be deemed to be accepted by the Parent /Guardian once the booking form is submitted and confirmation of payment of fee has been received by Tennis4Kids. Tennis4Kids may cancel this contract at any time before the participant commences a term or camp for any reasons whatsoever. Tennis4Kids shall not be responsible for any loss and damage whatsoever arising from such cancellation but will refund fees for the remaining classes. Class times and fees are published on our website and in our brochure. Classes will take place each year from September to June with the exception of Easter, Christmas and Halloween School holidays. The parent may unsubscribe at any time during the year. The Participant cannot attend the class prior to the payment being made online. The Fees are not refundable or transferable in any circumstances whatsoever other than with the written consent of Tennis4Kids. The Parent warrants that the information provided on the Booking Form is accurate and up to date in all respects at the point of booking. Any changes will be sent by the Parent to Tennis4Kids immediately. It is the Parent responsibility to inform Tennis4Kids of any special medical conditions at the point of booking. This includes behavioural disorders. The Participant must not attend any Class whilst suffering from any serious illness or contagious disease or anything similar thereto. Tennis4kids reserves the right to send any Participants home if there is a continual breach of programme rules. (No refund will be given). Tennis4Kids shall not be responsible for any child left unattended by parents or guardian outside of allocated class times. Participants should be collected promptly at the end of the class. The Family Discount applies only to siblings when attending full camp. Full payment is taken when booking online. Tennis4Kids will not be responsible for any child left unsupervised outside of these hours. Tennis4Kids reserves the right to make date/venue changes if necessary. Tennis4Kids will operate to the highest safety standards. In consideration of the acceptance of above named Participant the applicant agrees that Tennis4Kids will not be held responsible for any accidents or loss of personal property, however caused. Any participant whose conduct is deemed by the camp manager to be detrimental to the best interest of the programme will be dismissed-no refund will be made. Tennis4Kids reserve the right to modify or delete any activity in the event of unforeseen circumstances. Places are allocated on first come first served basis. 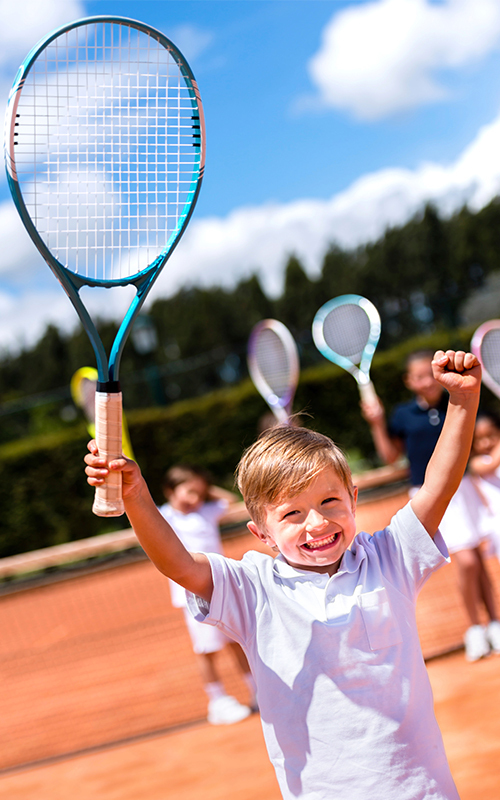 Any personal information provided to Tennis4Kids will be processed by Tennis4Kids for the purposes of administration, research and the provision of tennis coaching services. Tennis4Kids will not disclose this information to any third parties. Tennis4Kids itself may use this information to provide marketing information.